Discussion in '2nd Gen. Tacomas (2005-2015)' started by LVTacoma, Sep 20, 2010. Did this a while ago but have yet to post up. I know alot of guys are asking where to mount CB in our trucks and heres a cool set up I managed. 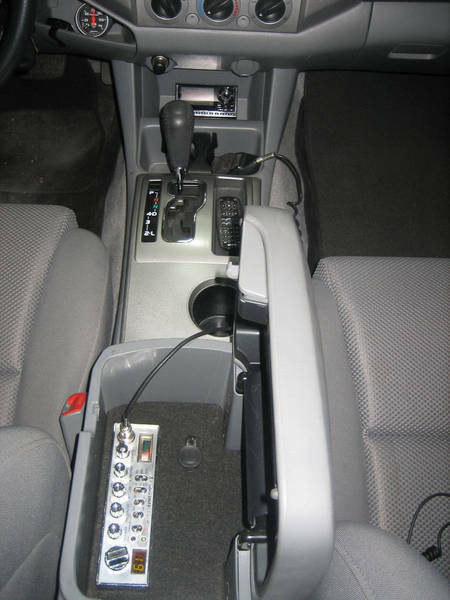 Center console mount with antenna cable under cab through a drain grommet, under the carpet and ran right into the center console from underneath. 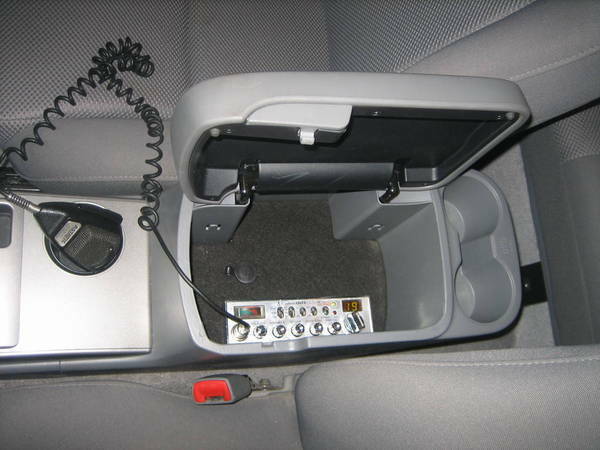 Bulkier CB units probably wont fit under the lid, but mounted up and down inside the console. Anyone else have their set up similar? Nice setup.... I did have something similar to yours but found i couldn't quite hear the speaker well enough when the lid was closed. Kind of a PITA driving around with the lid open and nowhere to rest your arm so i decided to buy a Cobra 75.... Much better IMO. Where is your antenna mounted pics? I don't see any of the pic ! Can you use a speaker from your CB, and mount speaker in location that would allow you to hear it? If you can do this, you can turn on your CB to a dedicated channel, turn the volume to a level that is best for speaker, run the CB mic cord out from a small nitch, and then close the lid for use. The 75 is a great little CB. All built into the mic means you don't need much room for it. You can hide it when not in use and i also find the volume is just fine, despite what others have said. I do however keep the volume near max without music on... IMO i think its better than the "cheaper" units but it does the same job, without the size. The aux speaker should wire/plug into the rear of the CB....atleast this is where it's been located in all of my CBs. In the rear is the power connection, antenna connection, and the plug for an external speaker jack to be plugged into. Take a look when you get a chance. I've had 2 of my past Jeeps (one Wrangler and one Cherokee) with an external speaker. Its a good set-up. For what its worth the Cobra 75 is a great alternative, especially if you looking to keep vehicle alterations that often results from mounting to a minimum. Here is the story behind my CB mount.